I have a passion for sharing bushcraft skills. And I am grateful I have been able to turn this passion into a means of earning a living too. So, it’s always nice to come across people with the same attitude, who are willing to learn, who don’t bring ego to the table. These people generally have some interesting insights of their own too. Mike Pullen is one such person I’ve come to know this year. It’s highly likely some readers of this blog know him through his YouTube channel TA Outoors. Others may know him through his dad’s YouTube channel TA Fishing. Mike’s channel has shown impressive subscriber growth over the last couple of years and to my mind this is down to Mike’s personality. He’s diligent, enthusiastic, energetic and likeable. He works hard at what he does and strives to make the best videos he can. As far as I can see, he deservers the audience he has built. Having a laugh in the woods with Mike Pullen. A fun couple of days filming for the video below. After meeting in person at the Bushcraft Show in 2018, we hatched a plan to do some filming for Mike’s channel, though the medium of which we would aim to share a bunch of bushcraft techniques, tips and tricks. So it was that Mike came to one of my teaching venues, where I run courses for Frontier Bushcraft and we set about working through a shopping list of skills Mike had drawn up. These are all areas Mike wanted to know more about or brush up on and I did my best to share core concepts, critical details and personal insights. I am impressed with your little hack putting one corner of the tarp lower than the other to facilitate tautening and shed the rain. I’ve never seen that mentioned anywhere before. Perhaps that’s your “secret” to staying dry under a tarp! Was a nice piece of work you did with TA Outdoors, really enjoyed watching the collaboration!! Paul, watched this on Mikes channel last night. It is a great vid. Many top tips to take away and put into use later. Liking the collaboration, will there be another? Hope to see more collaborations in the future. Very good video, most helpful information. Will have to experiment on wood types for fire lighting as we have different timber species than you use. Thank you very much for this video. I enjoyed it from start to end and appreciated all the small details that went with it. I will go and practise making sure to follow all the tips. I’ve never seen the technique of the coffee drop and will try that out. In South Africa we had a different technique to settle the coffee grounds. We added the grounds to the boiling water, let it boil for a few seconds and then took a burning piece of wood and stuck it into the coffee, extinguising the the flame and immediate removing the wood. The little bit of ash settles the grounds and gives a very nice taste to it. I demonstrated this to a bunch of Sunday school kid s at a picnic and all of them did not to have anything to do with the coffee. After some encouragement I got one or two to try and taste it and the delight on their faces covinced the rest to give it a try. In the end they even sucked the last coffee from the grounds. In SA most of us drink coffee with milk and sugar or condensed milk but even people drinking it black and bitter enjoyed the “veld coffee” as we used to call it. Always the best tips and advice. Superb Paul. Reinforcing the basics with those ‘nuggets of facilitation’ ! I don’t know how I came to be on your list, unless someone did it as a joke. I am a 75 year old widow. I used to camp but no longer camp. Therefore, I wish you would would drop me from your list. Another excellent video. As a relatively new student to bushcraft I found the axe guidance immensely useful. Keep up the great work! NEVER a dull moment! Really enjoyed the video, very informative. Many thanks. Great video!! You probably should have said something about the grain when making feather sticks… Looking forward to your next publication! The great thing about this video is that it shows how Paul is as gifted a teacher as he is knowledgeable and skilled in the techniques he gladly imparts to others. 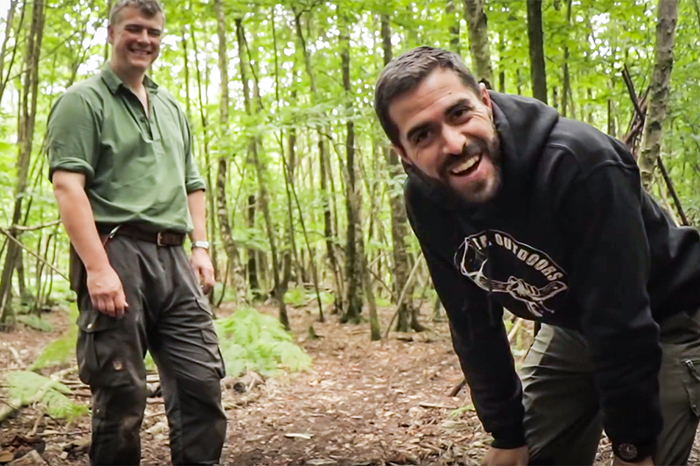 Hi Paul, great video of my two favourite Bushcraft hosts. As always some really useful tips, I especially liked the tip of slightly opening your hands when doing hand drill, (definitely save a few blisters !) what would be your “go to” drill wood in a emergency situation, if you were not carrying a pre-prepared one ? A really good selection of related skills that have inspired me to get out and practice again, thank you! It was useful to see you teaching someone especially with the hand drill, where little tips and adjustments to technique were clearly demonstrated. I’ve been following you for a couple of years now and also am a subscriber of Mike’s. It was great to watch you two work together. I really enjoyed it! Being a coffee lover myself, Paul, I was a little disappointed to see you use pre-grounds and not grind the beans yourself, lol, before making a pot. Kidding, of course, but I appreciate all you do for the bushcraft community. I’ve learned a ton from you, and am also a student of your Tree & Plant course. Thanks so much! Great collaboration which will hopefully expand the PK audience, the hand drill demo was excellent great tips. Also really liked the the axe demo from the Bushcraft show.Many thanks. Brilliant. This video was really informative with the ‘basics’ clearly explained, enhanced by a wealth of other, really useful subtle hints. It was great to see the hand-drill technique demonstrated so well, complete with some vital guidelines to improve success. Many, many thanks – I hadn’t intended to wat this in one go but I was riveted from the start and am now all fired up to go out and try and improve my skills. Brilliant thank you! Greetings Paul from oklahoma, i tried your technique this past weekend of splitting wood that you thought looked silly. It worked great on some 3 year seasoned twisted red oak. 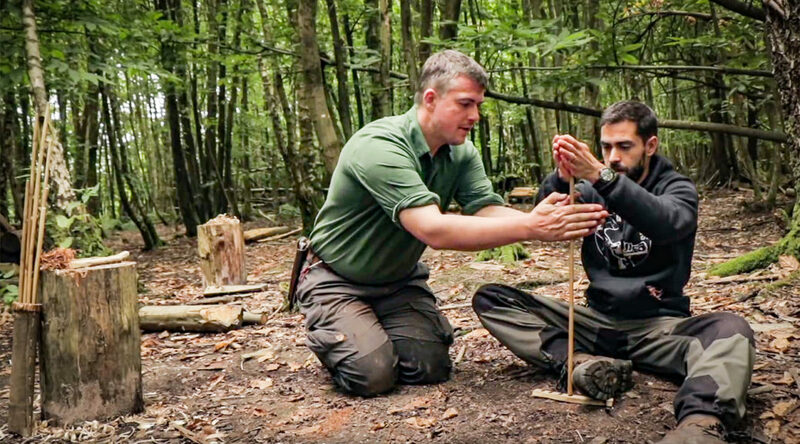 This video is fantastic, I come from years of watching religiously shows like Survivorman and others on the Discovery Channel, and though I’ve always been an avid hiker/camper, I’ve yet to really expand my own physical skill set in bushcraft. This helped me immensely, thank you! Yes, achieving then maintaining hand conditioning for hand-drill makes all the difference. Please keep up the FANTASTIC Work, and always love to see an email that a new “Ask Paul Kirtley” is out. Hi Kev, thanks for your comments here. Yes, it is a small world. It was a real blast filming with Mike. It’ll be good to do a round two at some point. And, yes there are more AskPaulKirtley episodes in the pipeline. Plus some good Paul Kirtley Podcast interviews too. I’ll keep you posted via your inbox. Really enjoyed this and learned a lot. The combination of your talents as bushcrafter and film maker was a winner. Created than the sum of your parts. I’m a long term admired of PK but sometimes feel editing would improve presentation. This hits the spot! Can we look forward to future episodes of your combined expertise? Thanks for the feedback Tony. I hope Mike and I can film some more together.